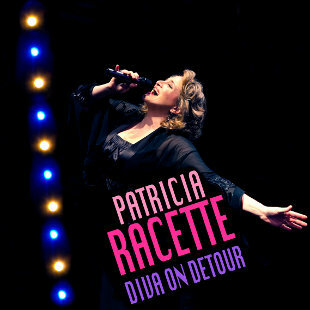 Readers will recall when I wrote in glowing terms of Patricia Racette's cabaret CD, Diva on Detour. On Sunday, January 27, I was privileged to hear her perform the same songs live at Manhattan's trendy 54 Below. Pat (you'll recall she and I are on first-names basis now) recorded the CD last spring, and Sunday's performance was a bit of a kick-off--although happily the CD has been available online for a while, I believe this was nonetheless considered a CD release party. I can only say the show far exceeded my expectations. I wrote in my first post (link above) about Pat's vocal stylings, her seamless blend of registers, her informed and wise choices in interpretation. All of that is still true. Even more true, in fact. There were only one or two choices I wasn't quite sure of on the CD, but in the live performance they made sense. What of the songs themselves? I loved them all! (You can see the track list at the Diva on Detour link above.) I wrote before of the Edith Piaf set, which again I adored, and of Pat's "shower song", Here's That Rainy Day. I loved I'm Calm, by Mr. Sondheim, and also Pat's encore, Not a Day Goes By, also by Mr. Sondheim. In singling out a few, I don't want to imply that there were any songs that I didn't like, because indeed I have no complaints at all. Well, only that we didn't get to hear the entire program again. And again! That's why I'm grateful I have the CD! Patricia Racette can be seen and heard performing the same show at 54 Below March 26-30. I'd heartily recommend going! Last week I was all a-twitter (heh heh heh--get it?) about the Norwegian Opera's La Boheme, because it was so lovely and I know and adore the Musetta from that production, Jennifer Rowley. 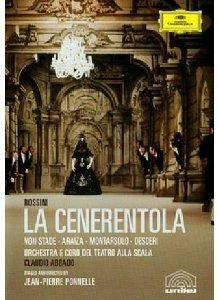 This week it's all about M. Ponnelle's movie version of La Cenerentola, starring Frederica von Stade and Francisco Araiza, people I can only dream of knowing personally. This was another Christmas gift I just now got to view. The 1981 movie is based on a 1973 La Scala production by M. Ponnelle and Mr. Claudio Abbado. I don't intend to go into great detail about everything I like about the movie (and there was a lot) or anything I didn't like (there were very few things). The most important things that I liked? Ms. von Stade and Mr. Araiza, of course. Both great singers at great times in their careers, and there seemed to be a great chemistry between them. I loved the acting of everyone, especially Paolo Montarsolo as Don Magnifico. He knew just how much to mug for the camera without overdoing it. Too much. I especially loved how the chorus was given wonderfully choreographed moves to do in unison while at the same time they were able to react as individuals. Here is a clip from the movie--the sextet I name in the title of this post. What a joy, a balm for my bel canto heart, to watch and listen to numerous performances of this section. 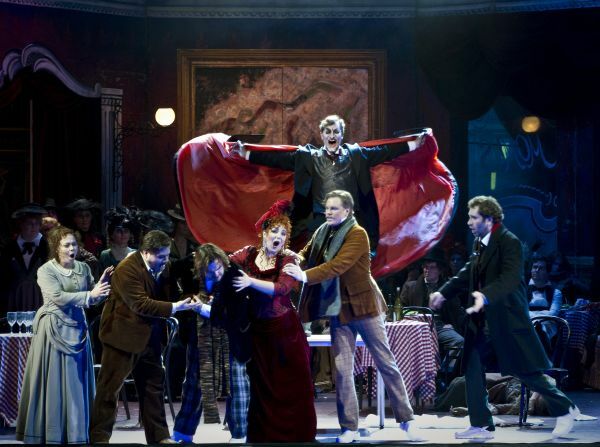 Imagine my delight upon having the opportunity to see the Norwegian Opera production of La Boheme (2012, Stefan Herheim) again! In fact, I now have it on DVD! It wasn't provided to me as a promotional copy. Oh no! I came upon the honest way: I manipulated family into giving it to me as a gift. I had seen it many months ago when Den Norske Opera offered the streaming video on its web site. I was thrilled to see it again this evening. This is a non-traditional production, as those wacky Europeans are wont to do. But it somehow works. Mimi dies in a modern hospital bed before the downbeat, and the entire opera seems to take place in Rodolfo's head. (He's a tenor, so there's lots of space in there.) The cast seems to alternate between modern-day medical personae and their characters in traditional stagings of the opera, almost seamlessly at times. One bit that I haven't seen before [spoiler alert] is using the same singer/actor as Benoit and Alcindoro (yes, that's often done, but keep with me) AND Parpignol AND the drum major at the end of Act II AND the guard in Act III until he is always on stage. A presence you can't shake. We realize more and more that he's Death. He's Dr. Miracle, the Serpent, a male version of the Loreley. He's Lon Chaney. Although some of the modern medical meshugass was a little intrusive, I have to commend all the cast on their total commitment to the concept. Poor Rodolfo, on top of two high Cs in the first act, has to live through the lingering death of his most beloved treasure every night in a traditional production, but in this production he has to do it in two eras and I don't know how many levels of reality! Still, the stentorian tenor Diego Torre was more than equal to the acting challenges, and his high notes rang beautiful and clear from beginning to end. I'd love it if his middle and low had been as consistent as his high voice. This YouTube clip (apparently the only clip he himself has put onto YouTube to date) shows greater consistency of sound throughout than we sometimes heard in this Boheme. The women in the cast acquitted themselves admirably. As a ghost from the very beginning, Mimi had challenges not encountered in most productions. Marita Sølberg was vocally and dramatically committed in this, her first Mimi. Alternating between the ghostly figure in hospital garb and the bewigged seamstress of 19th century Paris did not interrupt her beautiful and expressive singing. As Musetta, the lovely Jennifer Rowley, a fan of whose I gladly admit to being, was all spitfire and sultry vocalism. The Toledo Blade recently wrote of her Musetta at the Toledo Opera "Musetta [was] played to the hilt by Jennifer Rowley, a young and robust soprano who shamelessly stole every scene she appeared in -- just as it should be." I can not say less about this portrayal. 21st century tart or 19th century tart? Did it matter? Supporting cast was pretty darn good. The Schaunard of Espen Langvik and the Marcello of Vasilij Laduk were beautifully sung, and I must say I've never seen Schaunard fighting with Marcello for Musetta before. (I have seen Schaunard and Colline as lovers, but that's a different post.) Although the Colline of Giovanni Battista Parodi had occasional intonation issues, I would highly recommend hearing him again. (And gazing into those eyes of his at every opportunity! But I digress.) The choruses, both children and adult, deserve praise for rhythmic accuracy (it's not an easy opera to sing chorus in!) and for acting. 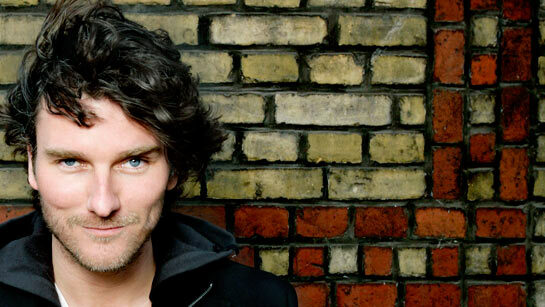 Handsome conductor Eivind Gullberg Jensen rallied the forces quite ably, and kept everything paced quite appropriately. I hope you have an opportunity to see this production. We are all richer to have it available to us on DVD. It might not sell you on concept productions or updating in general--and I'm still not sold--but it might make you think about La Boheme in an interesting new way. Which is the idea. Fresh from a Christmas vacation to rival all others, your faithful reporter has returned to bring you more recordings of mid-20th century singers we shouldn't forget. You might soon see posts about some of the loot bestowed upon me by loved ones, but that has not yet been determined. Today I come to write about Italian tenor Gianni Raimondi, whose name, in the worthy opinions of many, belongs beside Björling and Carreras when talking of great tenors of the 60s and 70s. He left behind far too few recordings, considering the level of his career. His La Scala debut was the famed Visconti production of La Traviata opposite Callas. In 1963 he was Rodolfo opposite Mirella Freni in Zeffirelli's legendary Vienna production of La Bohème, with Herbert von Karajan conducting. 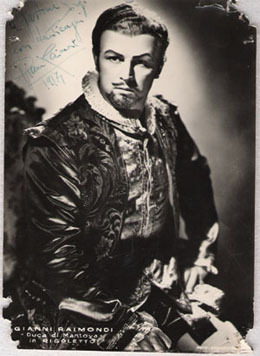 His roles in the early 60s included very high roles like Arnoldo in Guillaume Tell and Arturo in I Puritani, but by the mid 60s and in the 70s he was singing larger roles like Cavaradossi and Pollione.